Deciding to buy classic vintage guitar amplifiers is a tricky question. It’s a bit like asking ‘should I buy a 60-year-old classic vintage car’? Answer: Yes if you have always lusted after one and don’t mind the endless maintenance and ‘money sink’. No, if you are chasing some Holy Grail sound which is probably more due to your lack of playing ability than the amp. Ouch! I know. No one likes the truth. 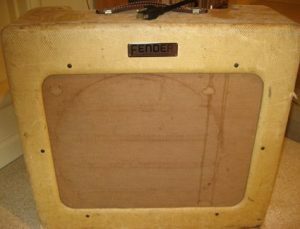 Buying a Vintage Guitar Amplifier – not always what it seems. If it’s image and ‘cool’ you seek, then, by all means, treat yourself to a classic vintage guitar amplifier. If you’re a sound aficionado if you’ve tried hundreds of guitar amplifiers and nothing will meet your exacting standards other than this particular 50-year-old classic guitar amplifier, then, by all means, go for it. Why not? Life is short. But be aware that a vintage guitar amplifier probably won’t live up to your expectations. It’s only a guitar amplifier, after all! Again, like owning a classic car, it’s fun to take it out for a spin now and then. But a classic vintage guitar amplifier is an expensive beast as they command a high price. So that means you probably won’t be wanting to gig it too much. And the better the condition of your classic vintage guitar amplifier, then less you’re going to want to bump it in and out of pubs on a Saturday night! In the good old days (the 1950’s) guitarists wanted a clean tone and saw distortion as bad. So classic amps are not big on overdrive. Acceptable sound levels were also a LOT lower back then, so vintage guitar amplifiers were underpowered compared with modern guitar amplifiers. 5W and 10W are not untypical power levels. 100W was unheard of back then. There is another really important factor to consider when deciding to buy a classic vintage guitar amplifier. And that’s the maintenance issue. Like classic cars, there are components (tyres, hoses, wiper blades, bulbs, foot pedal rubbers etc. etc.) which must be replaced, and usually with a modern equivalent. With classic vintage guitar amplifiers, the parts that need replacing are the valves and smoothing caps and also some signal caps as they don’t last forever. Even resistors go leaky and need replacing with modern equivalents. In short, be prepared for a BIG bill to get your vintage guitar amplifier up to spec. And because components will need replacing (and probably many have been replaced already) you’ll never get a 100% ‘authentic’ vintage guitar amplifier anyway, just as you’ll never get a 100% authentic (driveable) vintage car. Another point. In the main, manufacturers did not produce vintage guitar amplifiers on a strict quality-assured assembly line. They cobbled them together in someone’s garage usually! That’s an exaggeration, but the point is no two vintage guitar amplifiers ever sound the same. So what exactly IS this ‘classic vintage guitar amplifier sound’ you are seeking? Please also understand that almost every element of an old classic vintage guitar amplifier is JUNK compared with modern components! The resistors? Carbon composite junk – not a patch on modern carbon film high tolerance resistors. The smoothing caps? Old, leaky electrolytics. A decent modern equivalent is tons better. Signal caps? Laughable. Old leaky waxy caps which pass some DC and play havoc with bias. Valve rectification? Only done because the silicon diode hadn’t been invented! A 50p bridge rectifier will do the job better and without all that heat and light. Valves? If they are original and well used the only place for them is the bin! Good in their time but well past their use-by date now. Pots? Probably scratchy and worn out. Wiring? Cloth covered bare wires! Yes, cloth covered. The plastic insulated wire is, let’s say, a tad better, particularly with 500V flying around! Speakers? Paper coned rubbish compared with a decent speaker these days. If you own a vintage amp the first thing you should do is remove and store the original speaker and replace it worth something which actually works and doesn’t sound like crap! You’ll need the original when some fanatic buys your classic vintage guitar amplifier and insists on it being ‘original’. They’re welcome – you’ve done your time! You’re getting the drift here. There’s a lot of hot air and smoke and mirrors about vintage guitar amplifiers. People hear what they want to hear. I guarantee in a blind test most guitarists wouldn’t choose a vintage amp any more than a motorist would choose a vintage car. They are, after all, total dogs to drive with no facilities to speak of. But if you like the feel of the wind in your hair whilst spooling along in your 1930’s convertible, drawing a few admiring glances, then go for it! Just don’t expect great performance and prepare yourself for some sizeable garage bills. On the plus side, there’s always some newcomer with their tongue hanging out, eager to snap up your vintage guitar amplifier if you sell it. By the way, I’ve been repairing valve amplifiers for 40 years so I think I know more than most people. If you are looking for high-quality valves for your amplifier click here. ← Red Plating in Guitar Amplifier Valves – What is it? Articles like this one make me want to share such useful and practical information with all of my friends. I would definitely hate to miss your future posts, so please keep me updated. Thanks Steve I always try to write what I believe to be useful info. Lots of debate on all these subjects of course! Loads of sense here, thank you. One minor comment would be, valve rectifiers behave differently to diode rectifiers under some circumstances, and this can affect the sound in a way that some players* find desirable. (It’s about ‘sag’ and compression – there will be a decent write-up somewhere on the web). That’s why you can get valve rectification in some modern-production amps.